The thrilling Village Festival is a fun way to get active, have a go at a variety of fun sports activities in a safe after school event in their community while receiving important social messages to improve their lifestyles. 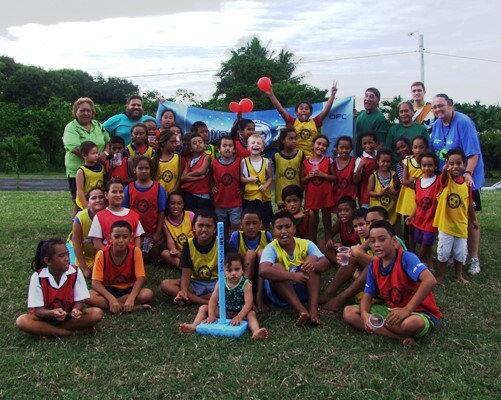 Cook Islands Football through its Just Play Program and its partners combined Rugby, Cricket, Handball, Athletics and Badminton, bought many new and exciting activities for all the children to experience. Just Play Manager Michelle Paiti said “lots of children really look forward to the fun Village Festival every month where they can get together with their peers and be active, learn about key social messages and have a go at different sports they might not normally have the opportunity”. The Social Message for the month was Gender and this was delivered by Ruta Pokura of Internal Affairs Gender Division. Ruta encouraged the children to be respectful, courteous and kind to each other. The Just Play Program has partners with the Gender Division to help promote equal treatment of boys and girls, through positive encouragement and participation in a sports environment. Paiti would like to acknowledge the continued support and funding through the Just Play Social Development Programme from the Australian Government (AusAid), Oceania Football Confederation (OFC), UEFA and UNICEF as well as all our local partners.